This USB-C™ multiport adapter with HDMI lets you add vital connections to your MacBook or Windows laptop, through a single USB-C port. 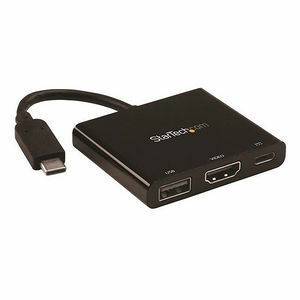 Connect a UHD 4K HDMI Monitor For maximum productivity, connect your USB-C or Thunderbolt 3 laptop to a 4K 30Hz monitor, using this USB-C to 4K HDMI adapter. You can also connect to an HDMI projector or TV in a boardroom or other meeting space, to deliver presentations on a shared screen. Charge Your Laptop The USB-C adapter lets you power and charge your USB-C laptop during a presentation or while you're working, with a USB-C Power Delivery port. Even if your laptop has only a single USB-C port available, you can keep your laptop powered. Add a USB 3.0 Port This USB-C multiport adapter offers a USB 3.0 port that's backward compatible with older USB devices - ideal for data transfers, syncing, or charging your mobile devices. Travel-Friendly Design The compact all-in-one adapter is a vital accessory for your USB-C laptop. With its small-footprint design, you can take it with you anywhere you would use your laptop. CDP2HDUACP is backed by a StarTech.com 3-year warranty and free lifetime technical support. Note: To ensure full adapter functionality, your laptop's USB-C port must support USB Power Delivery and DP Alt Mode.